A rather confusing news article from the Guardian written: European countries spend billions a year on fossil fuel subsidies, survey shows by Fiona Harvey. Who those “green campaigners” are is not really clear from the article. There is no link to their survey either. All the links in the article go to other Guardian articles. It is not really clear how these campaigners surveyed those countries or what their methodology was. What is known are the surveyed countries: the Czech Republic, France, Germany, Greece, Hungary, Italy, the Netherlands, Poland, Spain, Sweden and the UK. Let’s start with the break-down of the fossil-fuels subsidies of those countries as reported by the Guardian journalist. This entry was posted in Energy and tagged Fossil-fuel subsidy on October 3, 2017 by trustyetverify. Comparison subsidies for coal/nuclear and renewables: apples versus oranges? Support for renewable energy in Germany is nothing compared to the aid that has gone to coal and nuclear power in the last forty years. It received 631 billion euro of aid, compared to 67 billion euro for renewable energy. Also the support for renewable energy reduces year after year. That doesn’t make much sense. Those three sentences raise more questions than they answered. What do they consider renewables this time (solar and wind or also hydro and/or biomass)? What is their exact definition of a “subsidy” and is that the same for both renewables and coal/nuclear? Even if these are the same or similar, is it fair to compare both subsidies over a 40-year time frame considering coal and nuclear were there from the beginning and renewables only got traction in the last years of that period? They suggest that subsidies for coal/nuclear are high, contrary to those for renewables that are low and ever lowering. Is that really true? This entry was posted in Energy and tagged Energiewende, Fossil-fuel subsidy on March 28, 2016 by trustyetverify. could help deter potential protests. high fiscal cost for the government. Most claimed that the disadvantages outweigh the advantages. Okay, IF the issues are actually subsidies (and not just an artifact of the Price Gap approach), then I basically can agree with all of them, pro and contra. But I do recognize these disadvantages. They are ridiculously close to the disadvantages of renewables subsidies. In my humble opinion, the disadvantages of fossil fuel subsidies also apply to renewables subsidy. For example, the subsidies of renewables made energy much more expensive and energy poverty are on the increase. This is only the beginning. In 2012, our Minister of Economy froze the energy prices, so power companies could not charge more to the costumer. They did swallow all the extra costs themselves. Until now. But this will be undone next year and the expectation is that prices will then rise with 30% to compensate for the loss these companies had since the rule was introduced. If the price increase until 2012 already had a negative effect, then wait until the prices are free again and power companies are starting to recuperate what they had to pay until now. In the meanwhile the benefits end up going mostly to the richest citizens. In our little country it went to those who could free up the money to invest in renewables and harvest the subsidies. “Crowd out more productive government spending” is not hard to understand. If a billion euros go to the aid of the renewables that are not economically viable, this means less budget for other issues. As long as wind and solar are seen as the only solution to our energy problem, the money will go to intermittent power production. At first it seems a bit counterintuitive, but subsidizing renewables discourages investment in well needed technology, even if they are necessary to make intermittent energy to work in a continuous working system. Even Agoria realized that the current subsidizing of intermittent energy sources discourages investments on storage of energy when production exceeds demand. No doubt that it messes with the law of supply and demand. Subsididizing renewables makes other forms of power generation uneconomically, therefor nobody wants to do necessary investments in replacing old power stations that should be taken out of use. This means that the most needed new fast cycling gas turbines (needed to counteract the intermittent nature of the renewables) wouldn’t be build and our country stays with its outdated power stations. Which meant a danger to our power supply in the near future and, this somehow seemed to come as a surprise, more emissions… In the end they will be build eventually, but it would be a long road to get there and there would be a lot of resistance. Yet, they would not have other choices. The power generation infrastructure is old and there is a desperate need for new plants to replace older ones. This entry was posted in Climate Politics, Energy and tagged Fossil-fuel subsidy on July 9, 2014 by trustyetverify. It has been told in many shades and colors, apparently fossil-fuels are subsidized. I have never really perceived this as truthful, but also never looked into what actually is being claimed. It at least seemed exaggerated: my thoughts where that this “subsidy” was probably something else, but dressed up as a subsidy. Much of the hundreds of billions of dollars worth of renewable energy investment that is needed to prevent the worst effects of climate change could come from the substantial subsidies given to fossil fuels, a new report has found. Maybe a good time to start checking what these subsidies actually consist of. I had a hard time believing the statement that there is 544 billion dollars of subsidies on fossil fuels. As far as I know, fossil fuels fuel the economy. I can’t believe that someone in its right mind would subsidize something that is generating money. At least in our country, but also in our neighboring countries, fossil fuels are taxed heavily and governments EARN money from fossil fuel use. There are however some things that could indicate some sort of a subsidy. There are some groups of people that get their energy cheaper. For example, farmers are taxed less on the fuel for their tractors and other machinery. Also the poor pay less for their energy use. But the government doesn’t pay for their fossil fuel use, but get a little bit less income from it. The reasons for these are to keep the local food prices low or preventing that the poor come into problems. Another thing I considered was that the price of oil is not only the price of the product, transport and profit, but there are also other elements in it, some of it political, that make it much more expensive than just the product itself. Everybody needs it, so this will drive prices up. In that sense some subsidies could exist. Oil-exporting countries were responsible for approximately two-thirds of total fossil subsidies, while greater than 95% of all direct subsidies occurred in developing countries. This made me think about what this elusive “subsidy” is actually about. 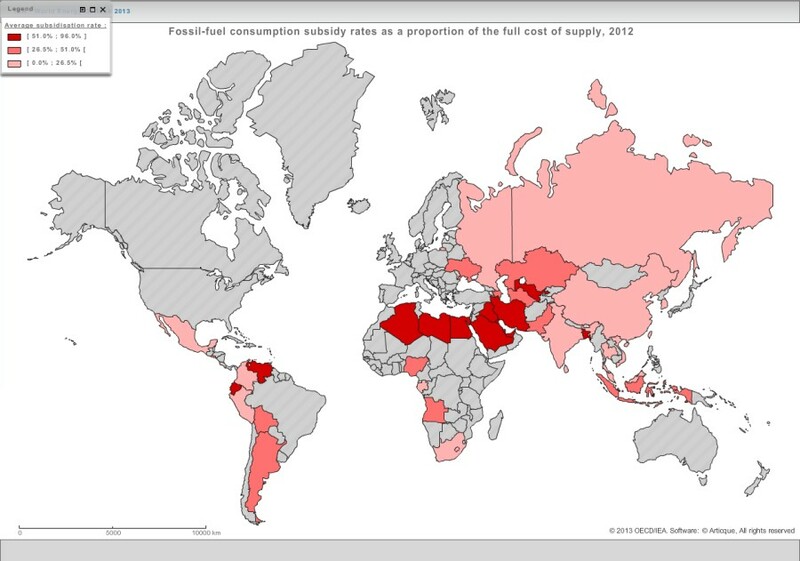 Apparently the inhabitants of these oil/gas producing countries pay less for the use of fossil fuels. But less compared to what? In most discussions it is not really defined and seems to be the “international market price” or the “world market price”. But the price of oil in the international market bears little relationship to the cost of production. So of course those people don’t pay the international price. They live in a country with plentiful resources. Their product is not scarce for them at all. To countries that they export to (countries with less of no natural fossil fuel resources like our little country), this oil or gas has more added value than in the country were it is plentiful available. A clear definition of fossil fuel subsidy is mostly missing from the discussions. Does it really mean that this subsidy is the difference in price of the product on the local market compared to the international market? Those governments will not really pay money to keep price low, but will have less income (compared to when they would sell it internationally). Or do they let them sell cheaper than the production cost plus the profit for the producer? In that case they are actually paying community money for the local distribution of their product and I would have no problem calling that a subsidy. So I am not really sure how much of these 544 billions of “subsidy” is actually a subsidy or rather an artifact of their price gap approach. But this reference price of a product can be substantial. This was made clear in a paper of the University of Uyo. Nigeria is the largest oil producer in Africa and the president came to the idea that the fuel prices of petrol and household kerosene (which were the fuels that were regulated at that time) were too low. Before 2012 those fuels were sold for 65 Naira per liter at the pump. The imported price was 138.81 Naira per liter, so the president called the difference of 73.81 Naira a “subsidy”, as whispered in by the IMF, World Bank and others. The investigators now calculated the production price as 34.03 Naira per liter, this when the prices would be dictated by the forces of demand & supply, in stead of international demand which is substantially higher. But then there is that other issue. The claim was that much of the hundreds of billions of dollars needed for subsidizing renewable energy could come from the fossil fuel subsidies. Even if it would be actual subsidies, it is a developing nations thingy and the money that was used as a “subsidy” was for about two thirds generated by the selling of … fossil fuels, probably with a huge profit. How much chance is there that these “subsidies” could go to investments for renewables? Whatever the developed countries would save would be insignificant. Unless of course the developed nations could get the developing nations crazy enough to let them adopt the international prices in stead of the prices of demand & supply and to use the “saved” money to invest in renewable energy in stead of other pressing priorities such as for example health care or education. This entry was posted in Climate Communication, Energy and tagged Fossil-fuel subsidy on July 6, 2014 by trustyetverify.